On August 15 at 9 a.m., Judge Eric Bloch of the Multnomah County Circuit Court will conduct a 2-hour hearing on challenges to the constitutionality of the campaign finance reform Amendment to the Multnomah County Charter (Measure 26-184) approved by the voters of the county by a margin of 89% "yes" to 11% "no" at the November 2016 election. Tuesday, August 15 9:00 a.m.
​For those of you who live in Multnomah County we need your help. Many of you voted in favor of Measure 26-184 which establishes campaign contribution limits. Last Thursday (April 6), Multnomah County commissioners Kafoury, Meieran, Stegmann and Vega Pederson voted to toss Measure 26-184 over the wall to the courts, neither supporting nor defending it. Ironically, they all expressed support for campaign finance reform just prior to voting against campaign finance reform. Multnomah County voters passed measure 26-184 by a generous margin - almost 90%. It is the duty of our commissioners to support and defend Measure 26-184. They are not doing that. In an effort to change their minds we're asking supporters of Measure 26-184 to attend the Multnomah County board meeting this coming Thursday(4/13) at 9:30am. Let's pack the board room and show them what we're made of. Can you make it? Oregon laws consistent with the freedom of speech guarantee of the United States Constitution may regulate contributions and expenditures (including transfers of money or resources) with the purpose or effect of influencing the outcome of any election. We have started gathering signatures to qualify this for the ballot. Right now we need 1000 valid Oregon voter signatures. Later we will need over 117,000 signatures. We won 89-11%. Must be some sort of a record. We are on the street collecting up the lawn signs. We have a map of most but not all locations. If you have a lawn sign, you can dropt it at one of the ﻿Lawnsign Collection Points﻿. Thanks. The establishment papers (Oregonian and Portland Tribune) say Vote NO on Measure 26-184. What more do you need to know? Measure 26-184 is a Multnomah County ballot referral to reduce the influence of large campaign contributions and expenditures on candidate elections and to increase the information available to voters on the sources and amounts of political campaign funding. With big money interests dominating politics nationally, strong campaign finance laws are critical to protect the integrity of local elections — our elections. Multnomah County is no stranger to flow of big money. In 2014, the race for County Commission Chair set a record, with the winning candidate spending $466,000. The future does not bode well, as Oregon is one of 6 states to place no limits on campaign contributions. Last year, the Center for Public Integrity ranked Oregon 49th worst in the nation in controlling “political financing,” beating only Mississippi. Big money in politics weakens our democratic institutions, undermines confidence in government and excludes the vast majority of citizens from seeking public office. of, by and for the people by . . .
Limits contributions to candidates from individuals and political action committees to $500. Limits the amount of money that can be spent independently — separate from money given directly to candidates — supporting or opposing a candidate. Keeps corporate money out of candidate races. 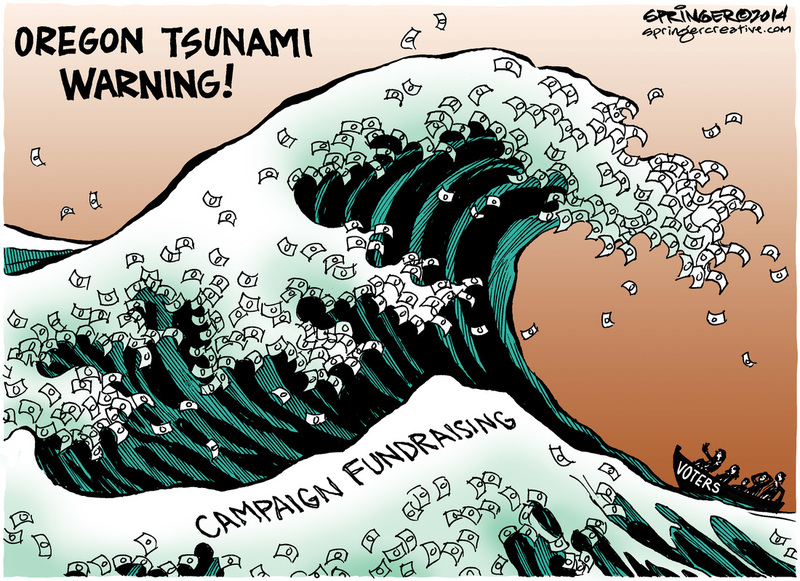 Makes candidates focus less on needs of big money donors spend more time listening to voters. Enables more candidates — including women, young people and people of color — to run viable campaigns against candidates with ties to deep-pocketed interests. Requires that political advertisements disclose the real identity of the top 5 funders of the ad. Reduces the appearance of corruption and the opportunity for outright bribery. We need your help to get this done. volunteer time to help with the campaign. donate because we cannot win on a wish and a prayer.